Leopard Lodge is an exclusive, private four star function venue on a 248Ha game farm situated in the protected natural environment of the Magaliesberg Mountain range in the Hartbeespoort Dam area. The lodge offers guests a peaceful country atmosphere and yet it is just a short 55km drive from the hustle and bustle of Sandton and 60km from Pretoria. The farm abounds with bird life including the third largest breeding colony of the endangered Cape Griffon Vulture. Resident game includes Giraffe, Kudu, Blesbuck, Impala, Blue Wildebeest, Red Hartebeest and Zebra. Leopards are very scarce but have been sighted occasionally, mainly at night. Excellent cuisine is served in the restaurant and the Ingwe bar is fully licensed. Our African bush lodge was designed to reflect the natural surroundings and makes use of the natural resources wherever possible. We have 14 en suite deluxe hotel rooms, three of which are free standing log cabins, four of these have a queen size bed and the remainder have two three quarter beds. Furthermore, air conditioning is available in seven of the rooms and two of these have their own private outdoor spa baths. 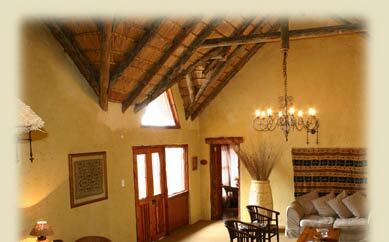 We also have one two bed roomed self catering cottage which has a lounge, kitchenette and outside braai area. The Tourism Grading Council of SA has awarded all our luxury rooms together with the lodge itself a 4 star grading and the deluxe rooms 3 stars. Functions are held either on our verandah, in our restaurant, in our boma or even in the bush. 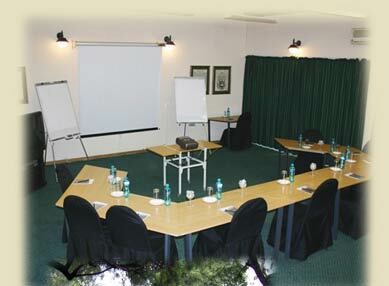 All functions are tailor-made to suite your specific requirements. We can organise everything from the menu to the guest entertainment. We offer a personalised and professional service for all events and flexible packages to suit both your budget and personal style.